Family and friends held a candlelight vigil Wednesday night for an 18-year-old San Jose woman who died in a car crash last week. The teen, Dulce Capetillo Hernandez, was 7 months pregnant at the time of the crash. Her baby survived, and his condition is improving, according to hospital officials. 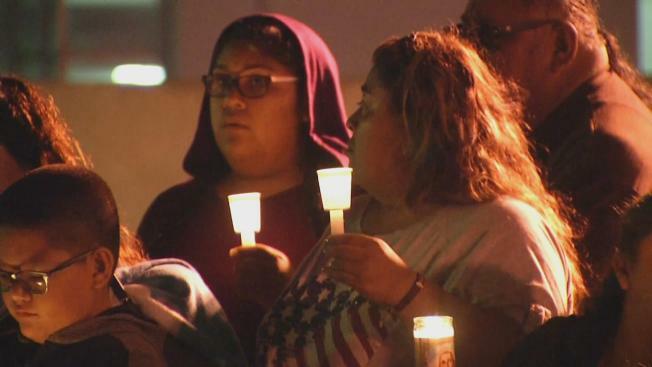 The vigil took place at Valley Medical Center, where the woman's family gathered to remember her and look toward the future. It was an emotional night for the Hernandez family. "They are actually allowed to take the baby and carry the son and feed with the bottle," said Elsa Lopez, who organized the vigil. "We just heard that today; it was very emotional." The family chose to hold the vigil on the rooftop of the parking garage across from the hospital where Capetillo Hernandez died last week after a solo car crash on Highway 101, south of Tully Road. It's also the hospital where her newborn son is surviving. "We’re here to pray for the family and pray that they will gain strength," Lopez said. Capetillo Hernandez was on her way home after working the night shift at a fast food restaurant in Morgan Hill. With her brother behind the wheel, the two were heading to pick up her fiance at his job in San Jose when the car veered from the highway for an unknown reason. It slammed into a BMW parked on the shoulder of the road. Police say the driver of the BMW appeared to be intoxicated, but Capetillo Hernandez's brother had no drugs or alcohol in his system. "Dulce was a very happy girl, excited to bring her baby home," Lopez said. "She was a regular 18-year-old, giggly, liked to joke around, good positive attitude, had a future planned." A future that is now in the hands of a newborn baby boy named Christopher.